One of the real highlights while at my Dad's last week was watching the lifeboat launch from the new lifeboat station. It wasn't a real rescue operation, simply a practice exercise, but the children learned all about the RNLI and what they do. Earlier that day we had been to the visitor centre in the lifeboat station, where the children got involved with some of the interactive displays. Here they are working out what activities are safe to do on the water and spotting dangers. 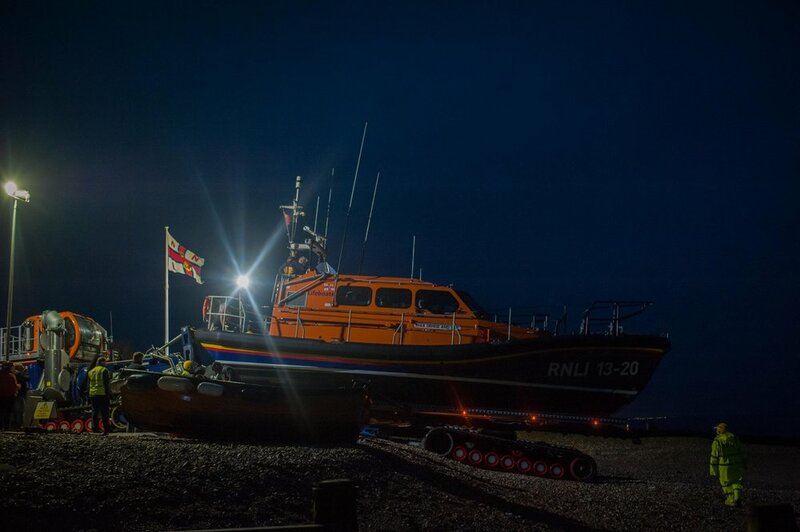 That evening though, after dinner, we all headed back down to the beach to see the lifeboat launch. It was super fun to be able to get so close to this beast of a boat. The hydraulic tractor that pulled it out of the station and down to the sea was monstrous! You can see Jenson in the pictures below pointing at it. We learned that the RNLI is a charity that saves people's lives at sea. The letters stand for Royal National Lifeboat Institution. An institution is an organisation established for a particular purpose, in this case, saving lives at sea. The patron of the RNLI is the Queen. A patron is a person who gives financial or other support to person, cause, organisation or other activity. The service the RNLI provides covers the whole of the United Kingdom and the Republic of Ireland. There are 237 lifeboat stations around the United Kingdom and the Republic of Ireland, with 346 lifeboats. Their lifeboat crew aim to reach at least 90% of all casualties within 10 nautical miles of the coast within 30 minutes of launch in all weathers. RNLI lifeguards patrol more than 200 UK and Channel Island beaches. RNLI lifeguards aim to reach any casualty up to 300m from shore within the red and yellow flags, within 3 1/2 minutes. The RNLI have four lifeboat stations on the River Thames in London, and three inland lifeboat stations at Lough Ree, Lough Derg and Ennniskillen in Ireland, and at Loch Ness in Scotland. They have 4,600 volunteer crew members. Crew members come from many walks of life. They volunteer as part of the lifeboat crew, this means they do it without getting paid. Most crew members have other jobs, for example some are teachers, mechanics, bar staff, students and company directors. Going out on a shout means they must stop whatever they are doing and get to the lifeboat as fast as they can - day or night! The RNLI raise around £182.7 million pounds every year. They can save up to 325 lives every year and rescue over 8384. After the lifeboat was launched the children had much fun running around the beach with only the floodlights from the lifeboat station for light.